AOL dial-up Internet users: How the AOL-Verizon merger could affect them. On Tuesday, Verizon announced that it plans to buy AOL for $4.4 billion. Verizon’s interest in AOL is being framed as mostly about two things—digital video content and advertising technology. But with the merger, Verizon will also acquire the dregs of AOL’s dial-up Internet service, and the roughly 2.16 million American consumers who here, now, in the year 2015, still pay to use it. For a bit of context, as of July 2014, there were an estimated 280 million Internet users in the United States. 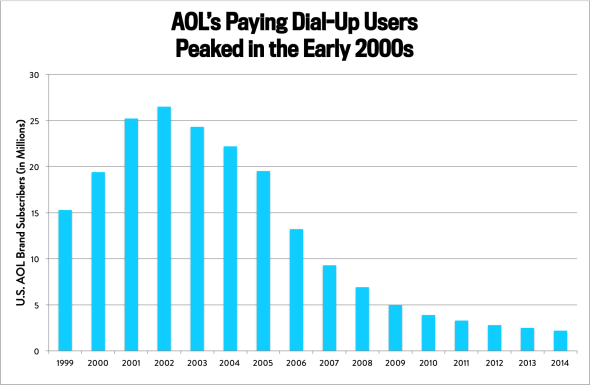 AOL’s dial-up subscribers would make up a mere 0.8 percent of them. At the same time, it’s hard to imagine more than 2 million people still sitting around, listening to the chirping dial-up tones, waiting for their connections to load. Why might anyone still subscribe to this service? For starters, lack of choice. The Federal Communications Commission has found that roughly 17 percent of the U.S. population, or some 55 million people, lack access to broadband Internet. In rural America, that lack of access affects more than half of the population. Data from SEC filings. Chart by Alison Griswold. What will happen to those remaining dial-up users once Verizon and AOL combine? One theory is that Verizon will target them for conversion to its high-speed Internet services. The current broadband market is largely saturated, so any opportunity to acquire new customers, however slight, is a potentially valuable one. Should most dial-up users choose to keep their existing plans, Verizon will still gain a nice bit of revenue; in the latest quarter, AOL’s subscription base brought in $182.6 million. Whether those dial-up users will be supported forever, though, is more dubious. “The question is, how small does the user base have to go to reach a point where it no longer pays?” says Chiagouris. “My prediction is that sometime between two years and five years from now when they probably won’t be supported.” Who knows? Maybe by then, we’ll all have Google Fiber instead.